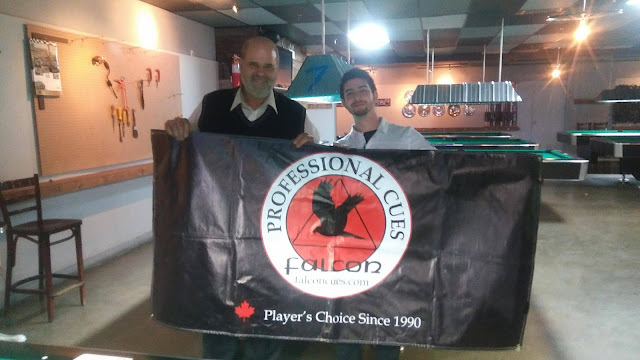 Over the weekend of December 2-3 Le Patriote situated in St.Eustache, Québec hosted the fifth stop of the Falcon Québec Pro Tour. It was another healthy field of 40 players that showed up despite competing with several other tournaments within driving distance. As usual the rules were call every shot, rack your own break from the box and alternate break. All the usual favourites were in attendance such as Alain Martel, Danny Hewitt, Dany Nguyen, Martin Daigle and more. Francis Crevier was really the only regular professional in the area that did not make it due to a Snooker tournament. There was a few new additions to the field this time such as Mike Petrowitcz from Barrie, Ontario and Stephen Scobie from Newmarket Ontario. Along with myself filling out the Ontario contingent there was Wayne Tate from Oshawa and Mike Black from Lindsay. Throughout day 1 there was no real upsets to report as all the favourites made it through. A notable match however took place against Alain Martel and Danny Hewitt which saw Hewitt being sent to the one loss side 9-6. In the 5/6 match up's it was Nguyen vs Patrowicz and Daigle vs Salvas. Nguyen winner of the last stop at Terminus in Gatineau who earlier on in the tournament eliminated Hewitt did the same to Patrowicz 9-7. Patrowicz is virtually unknown around these parts but I am told he is a very solid player and well known in Southern Ontario. That being said he held is own against some of the best players in Québec and fell just short against Nguyen. Daigle who has been easily one of the most consistent players recently eliminated Nguyen 9-5. He then went on to face Joey Cicero for the second time and lost another close match 9-7. Cicero who lost 9-7 to Martel in the winners side final earned his second chance at the "Dancing Bear." It takes more than one arrow to kill the "Dancing Bear." Less then a week after publicly questioning whether or not his game was slipping, and realizing he was no longer a top 5 ranked player in Quebec Alain Martel wins!The young gun Joey Cicero lead several times to start this race to 11. 4-0, 6-1 and 9-5 however it was not enough as Alain "The Dancing Bear" won 11-9! Great shooting to both players. Incredible performance by both players. I would like to thank Danny Hewitt and Luc Paquette for running a great tournament. The next stop will be January 13-14 a Dooly's Levis. Go to www.falconcuesquebectour.com for full detailsl.